Heat oil in 10-inch nonstick skillet over medium-high heat. Cook chicken in oil 7 to 10 minutes, stirring frequently, until no longer pink in centre. Stir in seasoning mix and 1/4 cup (50 mL) water. Bring to boil and cook 1 minute. Remove chicken from skillet. 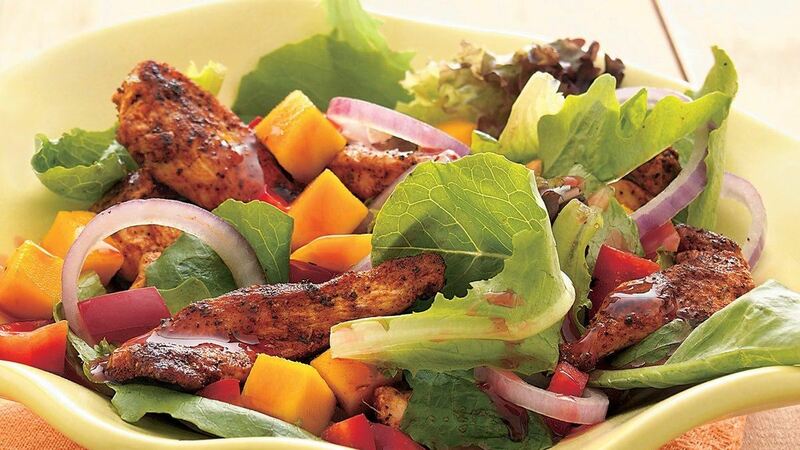 In large bowl, toss salad greens, mango, onion and pepper; divide among 4 plates. Top with chicken. Drizzle with vinaigrette.